I love the look of felt, but sometimes it's hard to work with. 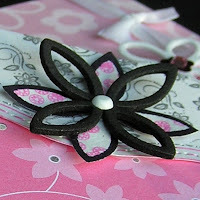 I find the stiffer cardstock backed felt easier to sew & to adhere to projects. 4. Stitch it or embellish it however you like. The Cuttlebug Link List turned 200 today! There's going to be more Cuttlebug stuff around here, since I was lucky enough to be asked to join in the Cuttlebug Challenge senior design team (insert squeal of joy here)!!! :O) I've been a fan for ages. Maggie always has the latest scoop and breaking news, and she& the talented design team make some truly astounding things. What an honour to get to join in the fun! 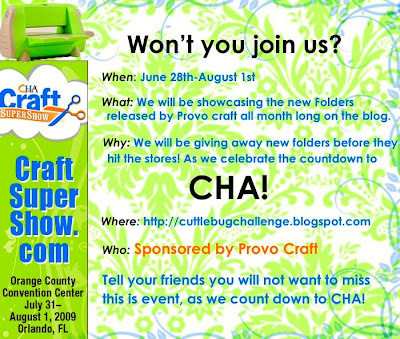 Summer CHA 09' Countdown Celebration! 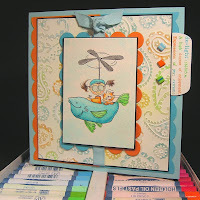 Want to follow the Cuttlebug Challenge blog? Add a blinkie to your blog? Check out the upcoming challenges? Just look in the right-hand sidebar on the blog. Thank you so much for taking time to visit! P.S. 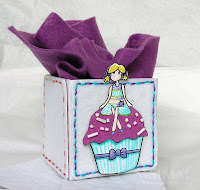 Now that I won't be neglecting my Cuttlebug anymore, I just have to get that Cricut Expression up and running too, LOL. Got to get SCAL already! Honey, I will help you with the scal also, and there is a $10 off coupon again for the next couple of days! I would LOVE to see your designs with SCAL and again will help you so get it OK? I miss you terribly!! You are so unbeleivably talented that I am not at all surprised by your new DT honor. 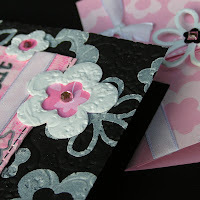 Congrats and thanks so much for that super cool embossed felt idea! Wowza, Mel! You definitely deserve a spot on the CCB team. I haven't really been over there too much, but I will definitely come by more often now! Hope you are feeling much better these days! You certainly deserve the recognition of being chosen for the design team. You are one of the top artists out there. Good luck to a special lady!! I think you're fabulous, and to prove it....You have been given a blog award. Please stop by my blog to see what it is. Congratulations Mel, you are very deserving of this. Love the felt, may have a go at that. congrats darlin' you are so talented. I always knew you should be a part of the Cuttlebug DT, Congrats!! Once again, to one of the most talented and MOST GENEROUS ladies I read, you share so much and give so much and make me laugh and congratulations, so deserving of the honor! Congrats for being chosen for the DT Team! You really deserve it. I am a big fan! Had no idea that would work on felt!! Thanks so much for sharing and Congrats on the design team, you deserve it! Congrats to you!!! I don't know of anyone who deserves it more! You are amazingly talented! I enjoy every entry of your blog. I really appreciate the time you take to share links with us and so many ideas! Thanks! I just wanted to stop by and say how much I love your cards. Amazing little creations! As a huge fan of your blog, I just have to say CONGRATULTIONS! You deserve to be on a DT Mel. I look forward to following all the new and amazing things you do. Congrats on the DT position - LOVE YOUR STUFF - TFS! Congrats on getting on the design team! This is fabulous! I have a huge box of felt I haven't touch in an age. I see felt in my future. LOL!